Elegant entry into USB 3.0 storage. DT106 features a gloss black finish with a cost-effective design to make adding to the USB 3.0 experience a minimal investment. 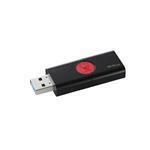 Available in capacities from 16GB-256GB**, DT106 is backward compatible with USB 2.0 and has a five-year warranty. ** Some of the listed capacity on a Flash storage device is used for formatting and other functions and is thus not available for data storage. As such, the actual available capacity for data storage is less than what is listed on the products. For more information, go to Kingston's Flash Memory Guide at kingston.com/flashguide.